I believe everything is simple when the right position is found from which to view the situation. Finding that position can be very challenging when being pulled in many directions simultaneously whether it’s employees, partners, clients, or vendors. Over the years I’ve found the single most important first activity is choosing the right frame of mind, the mindset, used to view the situation. The more you can be flexible in thinking when approaching challenges and opportunities the greater the odds of success. 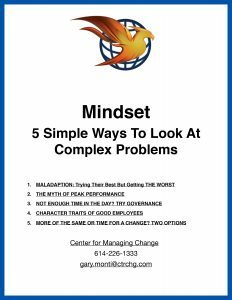 This e-book provides 5 mindsets for a variety of situations. Use ‘em! Fill out the form below to download your free ebook.